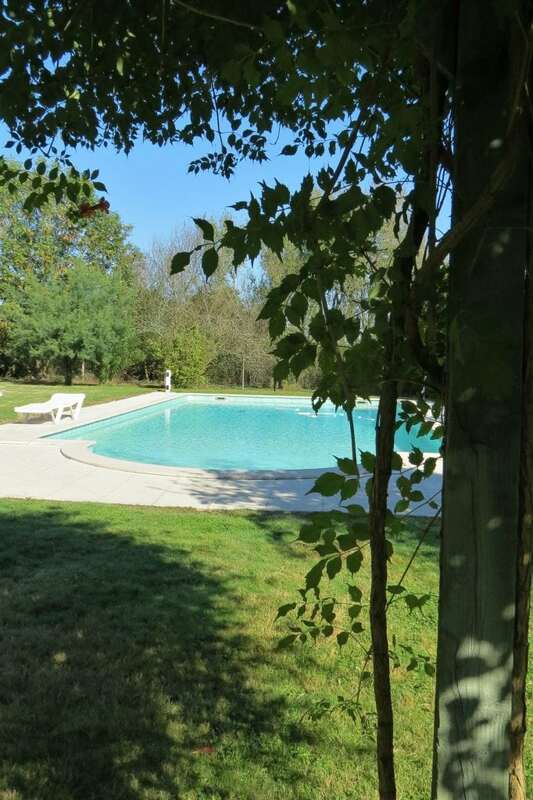 A Gluten Free Holiday In France At Domaine Du Pignoulet | The Free From Fairy. Some of you will have seen on social media that I’ve just returned from the most incredible gluten free holiday in France. 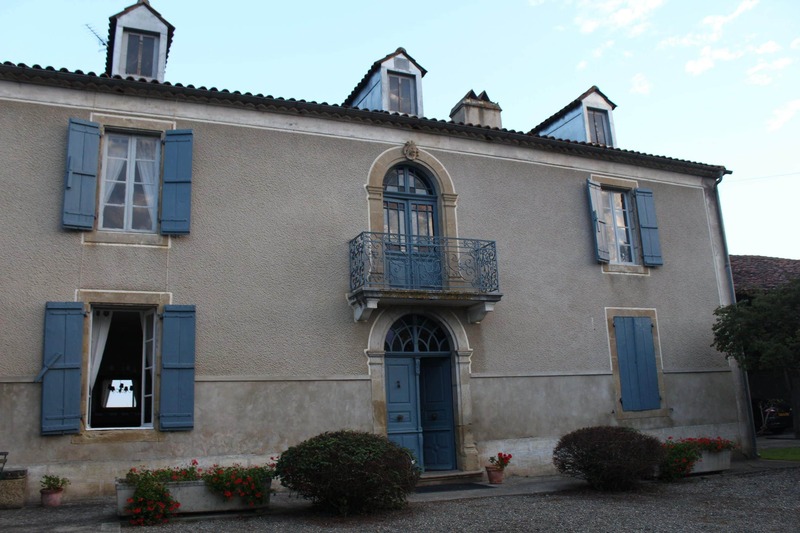 When I was invited* to Domain Du Pignoulet I wasn’t sure what to expect. It had newly opened offering a range of holidays from a holiday rental sleeping fourteen to B&B, full or partly catered holidays or fully catered pilates and yoga retreats. 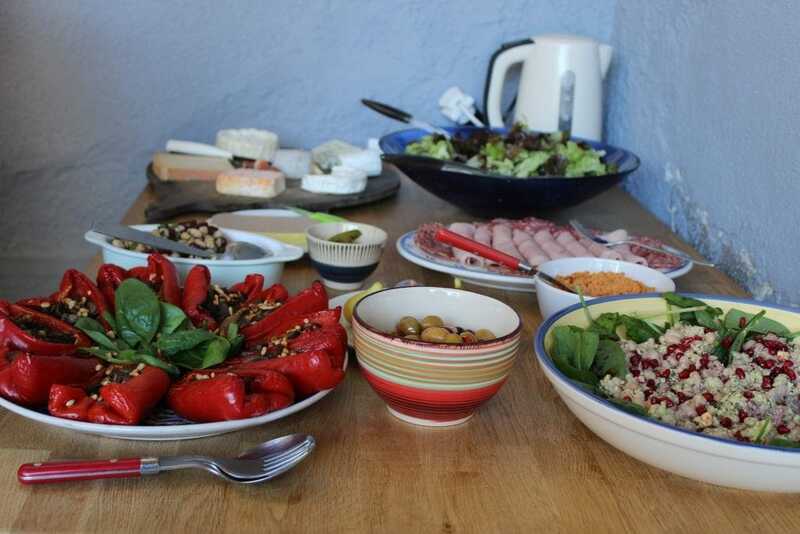 The owners Susie and James were keen to show us what they could offer with a fully catered pilates retreat. 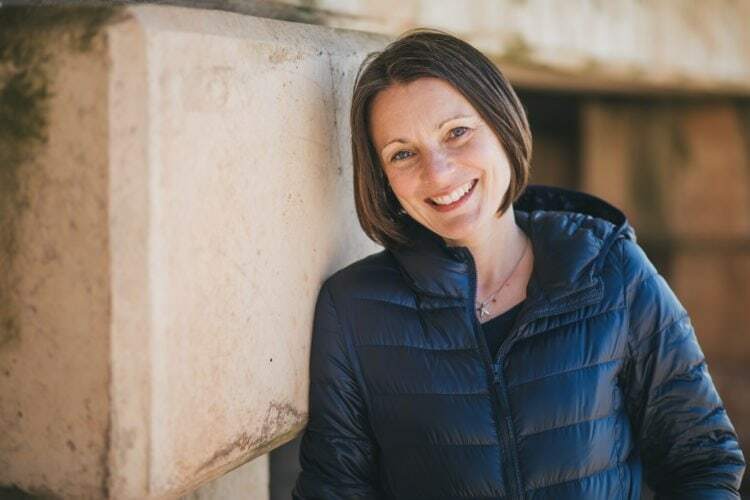 Susie is a fully trained pilates instructor, personal trainer, sports massage therapist and nordic walking instructor so we knew we would be in safe hands. Ten bloggers from the ‘Free From Gang’ turned up with our various dietary requirements to fully test their catering skills. Between us we covered the need to avoid all top 14 allergens and incredibly Susie and James managed this with no fuss and without making us feel awkward or different. In fact from the moment we arrived until the second we left we were looked after as if we were members of their family. As we drove through the imposing iron gates and up the long gravel drive they were waiting with open arms. After a tour of the house and grounds we were treated to a glass of fizz and an incredible seasonal buffet lunch. 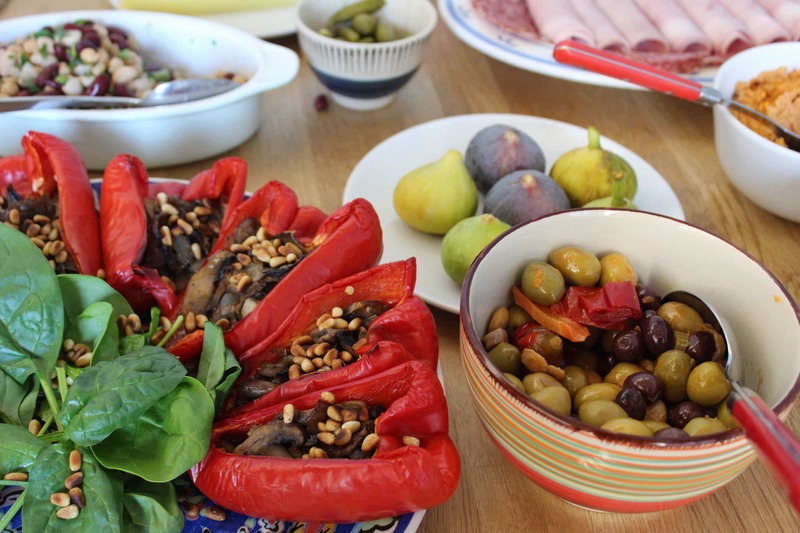 Everything was made from scratch with fresh seasonal produce, making this a gluten free holiday to remember forever. I was diagnosed with Irritable Bowel Syndrome in my late teens and since then eating has been a bit of a pain. My sensitive tummy reacts to even the slighted change to my diet. Thankfully with the care and attention that Susie and James paid to the food I suffered no ill affects. For the first time in over 20 years I was catered for with no after effects. What’s more, for the first time since ‘Roo’ was born I didn’t have to think about food at all. Normally when we’re on holiday I have to pre-plan all of our food. Shopping and cooking still have to be done, or a great deal of research has to be undertaken to find out if we can eat out. Even then we have the worry of ‘Roo’ getting ill on holiday. I would love to take ‘Roo’ back here one day so she could experience a worry-free gluten free holiday too. I’ve never felt so well looked after and relaxed. In addition to the incredible food making me feel relaxed, we were treated to a fabulous pool and plenty of pilates. And of course the sunshine was the icing on top of a very decadent cake. With the mercury hitting 32 degrees C the cold pool was an absolute necessity. Pilates is something I used to do before the children were born. According to Dictionary.com it is ‘a system of physical conditioning involving low-impact exercises and stretches designed to strengthen muscles of the torso and often performed with specialised equipment. Put simply it is a gentle form of exercise that helps to strengthen the core muscles in your body. In the photo below we were using soft balls to help strengthen and lengthen muscles. I have to say that I’ve never done pilates in such gorgeous surroundings. 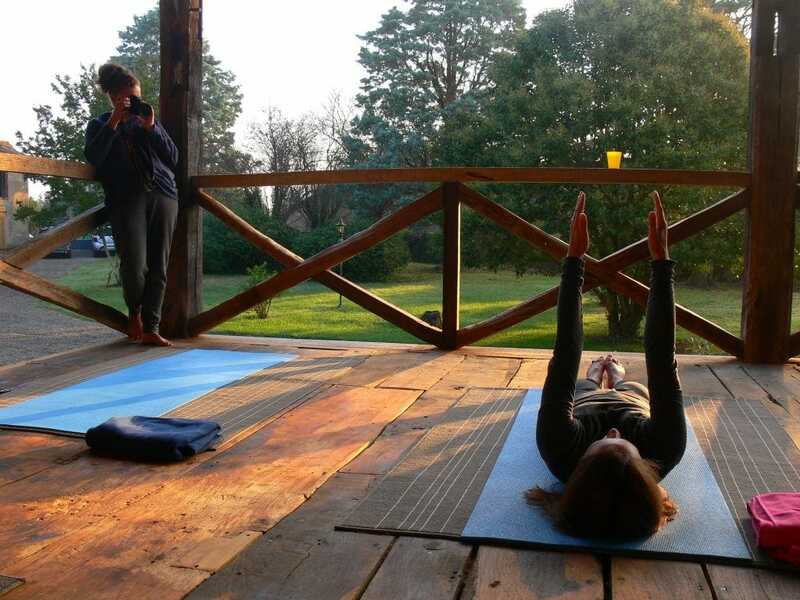 Our first class was at 8am with the sun rising directly in front of the outdoor pilates studio. An old raised barn providing the perfect backdrop to the lesson. We had a second lesson at around 5pm followed by an aperitif and supper. When Susie runs pilates retreats for others’ she often does 3 classes in a day but the choice of how many classes remains yours if you go in a group. Photo credit Midge Peacock from the Peachicks’ Bakery. Me doing pilates! There were a range of abilities in our group of girls. As I mentioned I had done pilates before but many years ago. Others had never done it and some did it every week. Susie adapted the classes to suit all abilities and we all felt stretched and ‘worked’ afterwards. I really can’t recommend it enough. In fact, I’ve found a class that I can attend here in the UK since coming back. Photo credit Midge Peacock from Peachicks’ Bakery. 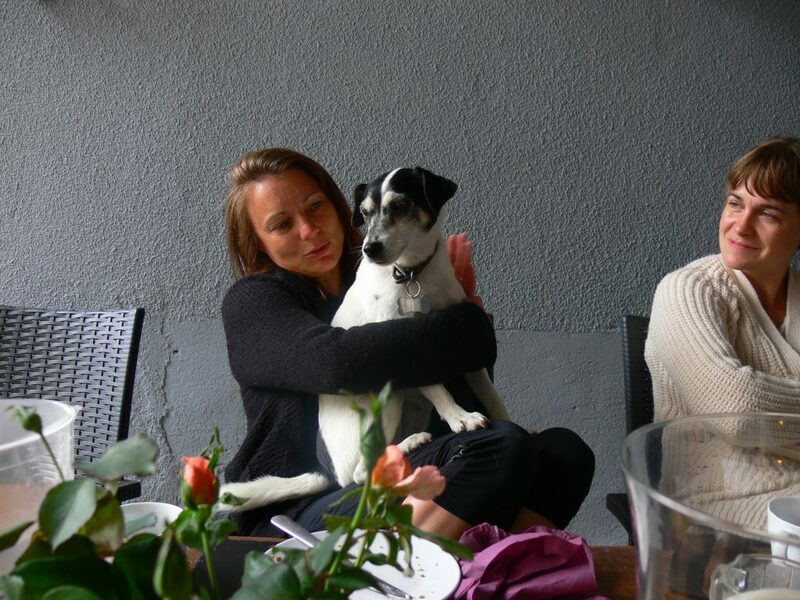 Me with Dotty the dog. However, if relaxation isn’t for you there are plenty of things to do in the area. 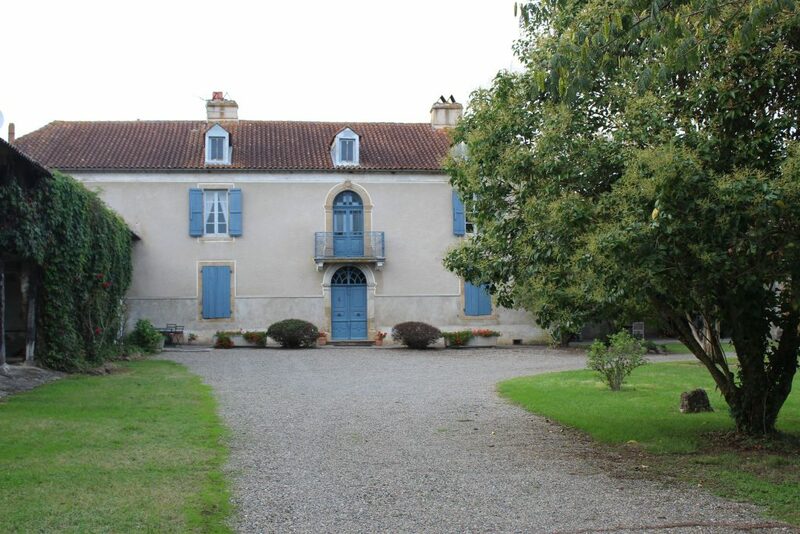 Set in the Midi Pyrenees, the countryside around the house is spectacular. There are lots of beautiful walking routes with maps to borrow. 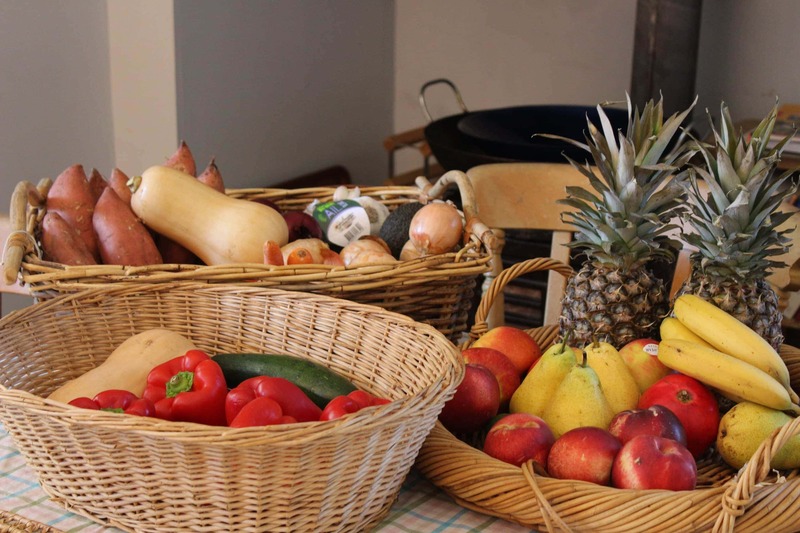 Most days there are markets to visit in the surrounding towns with Beaumarches, Plaisance and Maubourguet nearby. If you wanted to cater for yourself you can find supermarkets too. If you’re interested in having a stress-free gluten free holiday then I suggest you contact Susie and James for a quote. They will tailor your holiday to suit your requirements. One thing I’m certain of is that, should you wish, they will be able to cater for you whatever your dietary restrictions. 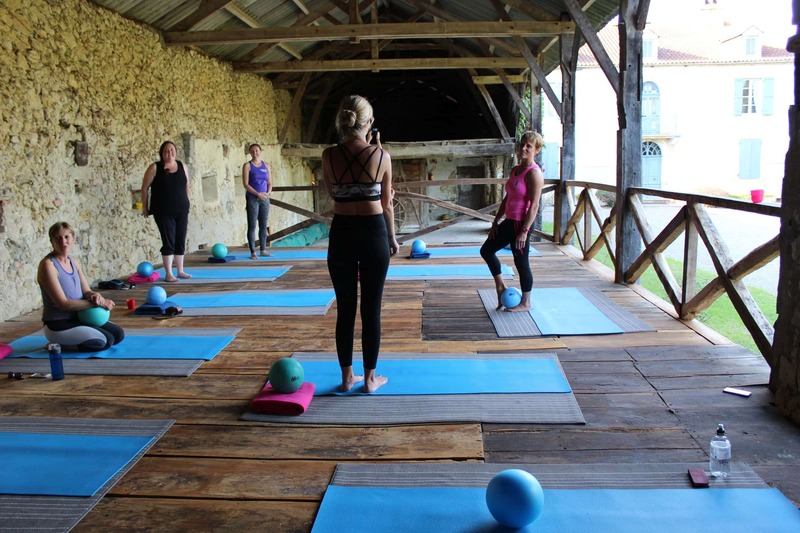 *I was invited to review the pilates retreat in exchange for this blog post. Despite this my review is an honest reflection of my views. It was not influenced by the fact that I didn’t pay for the retreat. This was the best gluten free holiday I’ve ever had and I’m booking for next year. Lovely review Vicki, and what a fab photo of you with Dotty, Oh how I miss her too, especially with her joining in the classes! I still have to pinch myself about that fabulous long weekend, we were so, so chilled and didn’t have to think about a single thing, we just relaxed, exercised, ate what was put in front of us and relaxed some more…pure bliss. That photo of you with Dotty is gorgeous Vicki and your arms look perfectly straight in the pilates photo!!! It was such a brilliant trip, can’t wait to do it all again next year. I know! It was amazing. THEY are amazing!